Moon Signs help define our emotional development, or express the unconscious side of our personality. It explains why we do what we do. This is where we retreat for comfort, childhood memories, and peace. This can also be the place where anger, hate, jealousy and fear may be found. The Moon also influences our senses depending on its placement in the birth chart. Most people will have their Moon in a Sign that is different from their Sun. This is why many people with the same Sun Sign can be so different from each other. They may feel that when they read a description of their Sign, that it is not representative of them. It may feel incomplete, or even completely inaccurate. Moon Signs may be a much more accurate description of what a person is like. If your Moon Sign is the same as your Sun Sign, you may find that it amplifies the traits of that Sign. This would make you a "double" of your Sign, such as a "double Gemini." 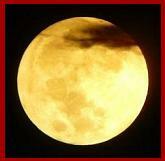 The Moon also governs the heart, stomach, brain, bladder, bowels and the left eye. It has influence with the glands and fluids of the body. The Moon is said to represent your instinctual self, which many people keep hidden. On points where your Sun and Moon Signs are compatible, they will work together to help you get through the hardships and accomplish your goals. Where they are not compatible, you will feel conflicting desires or be at odds with yourself in some way. For example, if your Moon is in Gemini, you may be very changeable emotionally. You may get stressed out easily, and the more people you discuss your issues with, the more confused you may become. Scorpio Moons also deal with a lot of stress, but tend to keep it all under wraps. Jealousy may be a big problem for a person with a Scorpio Moon. Aries Moons are headstrong, aggressive and may be difficult to control. They do best if they can find a physical outlet for their emotions, like sports. Our Moon Sign also offers insight in how to reach our inner child. If you don't know what Sign your Moon was in, you'll gain a lot more insight into your inner workings once you do. 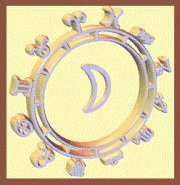 Use our free birth chart calculator to determine your Moon Sign. All you need is your birth date and time of birth. Since the Moon moves through each Sign so quickly (in about 2-1/4 days), the time of birth is important. If you don't know what time you were born, you can calculate your birth date at 12:01am and again at 11:59pm. If they are both the same Moon Sign, you have been successful. If they are different, read the descriptions for both and figure out which best describes you. Look for this glyph (symbol) on your birth chart and note the Zodiac Sign it's in. Once you've done this come back and read the interpretation below. Or choose from the links below. Each Moon Sign behaves differently when coupled with another Moon Sign; some get along wonderfully while others are continuously at loggerheads. Discover how your Sign interacts with all 12 Moon Signs.